Starting your own business and growing it into a profitable company is not an easy task. As an entrepreneur, you are the one who’s in charge of devising and implementing various short and long-term plans and strategies that will either make or break your company. You will also be dealing with various business partners and associates throughout the day, as well as manufacturers, retailers, employees, and customers, all the while trying to maintain a level of productivity necessary for the company to stay afloat. 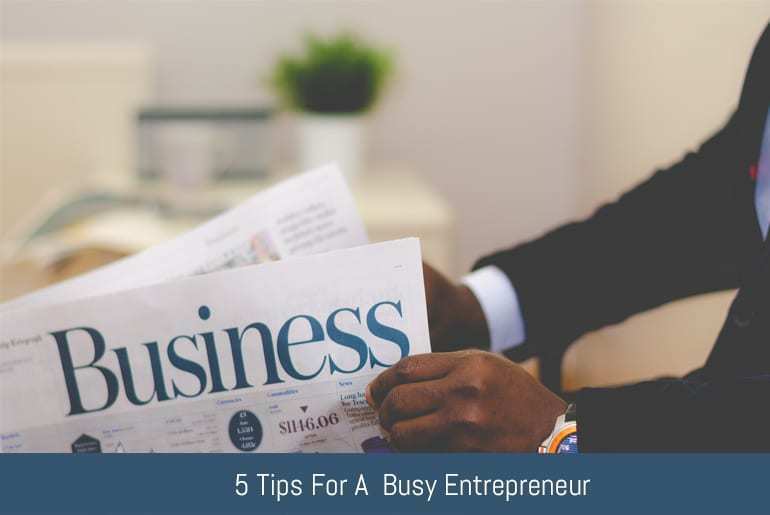 Here are five tips you can use to avoid becoming the “busy entrepreneur” and work out a system that best suits your individual needs. Most entrepreneurs would gladly sacrifice sleep and happiness by dedicating large portions of their personal lives in order to get to the very top. This type of behavior simply adds more stress to your life and can have a rather negative impact on both your physical and mental health. Instead of putting yourself and your company at risk by trying to get everything done by yourself, a far more efficient and productive idea would be to stop micromanaging every single aspect of work and letting people you trust to deal with issues that don’t necessarily require you to be there in the first place. The single most important aspect that defines a successful entrepreneur is their ability to market and sell. It doesn’t matter whether you’re marketing yourself as a person of interest regarding a specific project or you’re simply trying to find the best bid for one of your ventures, you need to be comfortable doing it anytime and anywhere. Remember, you’re not the only one with a busy schedule and you may only get a couple of minutes to present your case. Every now and then we hear a story about some random guy who just happens to venture into an unfamiliar turf and just happen to be dominating the marketplace and generating large amounts of revenue. Ideas such as these might sound good on paper, but reality, operating in an industry you know absolutely nothing about is next to impossible, especially when your profile is low and you only have a couple of available contacts. Not all ventures are created equally. Some show great promise of becoming the next big thing and can end up becoming an extremely lucrative business deal. On the other side of the spectrum, we have ventures that should’ve been killed off a long time ago, but people refuse to abandon the idea out of pride or simply believe the success is waiting for them around the corner. Learn to recognize failures early on and if your venture happens to fail, simply stash the capital and reinvest in a more reasonable idea. You’d be surprised by the number of times investors and entrepreneurs didn’t back a particularly promising venture because they didn’t have enough resources. Buying and renting homes, duplexes and similar types of properties is an excellent way to generate some side income. The only issue is that now you have to do the taxes and it only takes a single number to completely mess up the results. If you’re interested in purchasing properties yet know very little regarding the specific taxation methods, then it may be a good idea to invest in a seasoned company such as Pherrus and let their professionals handle all the work for you. Similarly you can generate passive income from other revenue streams like e-books, apps, courses and then creating an affiliate referral system for them. Once the product is out there, after your initial marketing push you can sit back and wait for the passive income to come to you, with minimal effort and maintenance. If you’re looking for a real-world example take a look at Forbe’s Interview with Pat Flynn who has made an amazing $3 million with passive income techniques! Being an entrepreneur is more than selling an idea to an investor. It’s about trying to grow, maintain and improve business productivity by delegating the work appropriately using a schedule dedicated towards your individual needs as an entrepreneur.